Humans: The Untold Story of Adam and Eve and their Descendants is a substantial novel in three parts by Joseph M. Luguya, which explores good and evil through human, mythological and supernatural characters, much of it in the form of a grand debate, delivering an intricate theological saga. 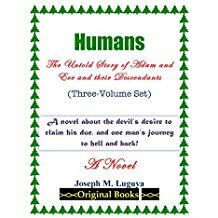 Humans includes three volumes: “The Thesis” (Volume One), “Mjomba and the Evil Ghost” (Volume Two), and “The Demoniac” (Volume Three). The scene that launches Humans appropriately involves both mystery and magnificence: “The International Trade Center literally sat on the edge of downtown Dar es Salaam, the beautiful metropolis … whose name fittingly signified “Heaven of Peace”. Christian Mjomba’s office was located on the twenty-seventh floor. In an unusual move, using a key he took from his wallet, Mjomba unlocked a side door to his office and slid furtively inside.” And from this opening of a mysterious door, Humans builds up to a complex yet compassionately humane story of Mjomba’s fascinating journey. And so, in a twist that makes Humans uniquely intriguing, Mjomba’s sincere efforts to turn the most evil force into good and, thus, save souls, ends up placing our hero himself at a highly questionable—and dangerous—position. Some of the arguments in fact ring true not only in the religious realm or in the historical context, but in our current world, festering as it is with religious tensions and ethnic prejudices: “Later, during his oral defense of the thesis, Mjomba would comment that one of the legacies of original sin was the perennial tendency of humans to never see evil in themselves, and to see nothing good in other humans – especially those who were different from themselves in some respect.” How true! In summary, Humans: The Untold Story of Adam and Eve by Joseph M. Luguya creates a dramatic confrontation between a virtuous young scholar and the most malevolent character of all, delivering an extensive, all-encompassing confrontation that becomes a metaphor for the very core of human existence. This thought-provoking, sprawling novel explores unresolved issues of faith and spirituality while the leading character valiantly defends all that he holds dear in the struggle between good and evil, life and death, and the opposing forces of divine creation. Readers will be enticed to contemplate the most fundamental questions of human existence and come away with a deeper understanding of both differences and commonalities that define us. Significant and Memorable!